Sooooo there's apparently a huge boxing fight (match? bout? tussle? punchy game?) 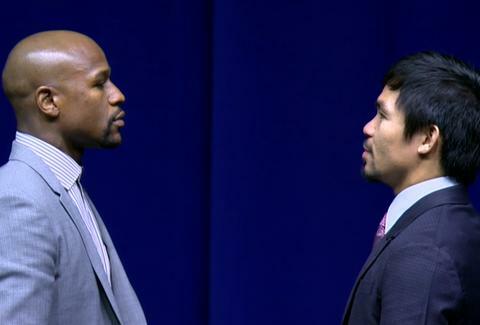 going down this Saturday between Manny Pacquiao and Floyd Mayweather. Soooo you're gonna need a place to watch it (the main event gets underway at approximately 10pm CT, undercards start at 8pm CT) AND get hooked up with specials. These 11 local spots should do the trick. Special: The "Beard & Boxing" event with James Beard Foundation includes the fight plus bites from Sunda, The Duck Inn, and Bottlefork from Rockit chefs including Amanda Downing. Tickets are $75-125, get them here. Special: $40 standing room tix; $300 VIP tickets come with a bottle of Grey Goose or Buchanan's Scotch, get 'em here. Special: Watch the fight on the biggest of big screens (it's a movie screen!) for only $10! Tix here. Special: $15 buckets of draft beer, $25 craft beer buckets. Get tickets here. Special: The $750 booth package includes two bottles of vodka here. Special: $50 GA tickets get you in the door and two drinks. Do it. Special: $75 bar seat includes one pizza and a drink here. Special: $4 well drinks, $5 bomb shots. Free buffet and 10 drink tickets with $100 GA ticket here. Special: $13 pork belly plate, $15 belly burger with seared pork belly, $7 3 Floyd’s Yum Yum, $6 Bell’s Oberon, $9 SlapShot Tripel Deke. Tickets right this way. Special: $20 Lone Star/Tecate buckets. Tix here. Special: $45 premium bar and an all-you-can-eat BBQ buffet. Tix here.